"Numeric lungs for my african capital city" LowHighTech prototyping technics ! 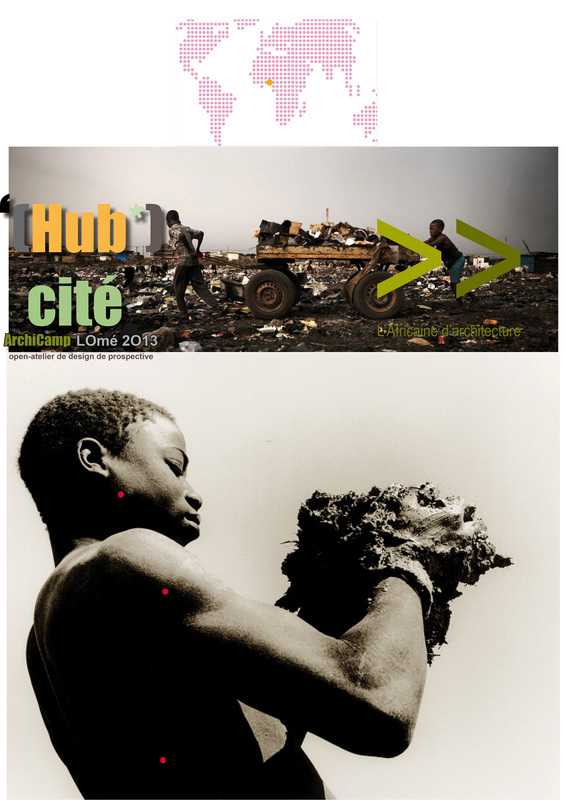 Lomé is the place for the second edition of our workshop confronting humble architecture – New Technologies. We will continue the reflexion we began last year on the three sites ‘orange’, ‘green’ and ‘grey’ developing the architectural projects in order to prototype them with the Fablab we create during the first edition in 2012. Indeed the WoeLab and all of its community will be associated to the workshop. During trhee weeks, three multidisciplinary teams will test solutions for the district-lab of the border zone Togo/Ghana and will set up embryos of architecture. Key words : RECYCLING. COMPUTER AIDED MANUFACTURING. PARAMETRIC ARCHITECTURE. HERITAGE. DIGITAL SOLIDARITY. DEVELOPMENT. COWORKING. DIY. GREEN TECHNOLOGY. LIVING AREA. e.WASTES. ESTATE ALTERNATIVE AND INCLUSIVE. PROSPECTIVE. AUTONOMY. Fablab *. EARTH ARCHITECTURE. 3D PRINTING. DEMOCRACY OF TECHNOLOGY. NUBIAN ARCHES AND DOMES. TECHNOLOGY GEOPOLYMERE. #LOWHIGHTECH. __Organization of the workshop : the workshop will be in Lomé (Togo, West Africa) from the 20th (arrival one day before) of July to the 10th of August. It will connect local population and participants-experts (students and contributors) supervised by the staff of L’Africaine. The workplace will be equipped with computer hardware, drawing materials, prototyping materials, 3D printer, a digital milling machine and tools for building. Some tours and visits, especially in Pays Tamberma or in Ganvié (Benin), are planned. The final jury will be composed with local actors, international experts and professional of schools. Infos : contact@lafricainedarchitecture.com / 06 99 33 42 47. 'Nativ and Lomé, capital city of Togo (West Africa) will host ArchiCamp 2012 for an [Hub*]City. Intensive workshop in situ, conferences and excursions will be organized in order to create architectural design for African "Hub".During three weeks, three multidisciplinary teams will join forces with the ‘techies’ of the city to design propositions about settlement and shape. The work will be presented to city council, local officers and financial partners. An original way to build sensible eco-projects which blend with the city. Information, registration: contact@lafricainedarchitecture.com tel: (+33) 699334247. Sénamé Koffi A. Camper will have to work on innovative layouts of the premises, closest to the reality of the city of Lomé : Traditions and Dynamics. Resources available locally. Renovations ? Transplantations ? Nomadic or permanent installations ? Economical and sustainable anyway. These incubators for technological projects will be real ‘digital lungs’ able to relieve and put a new life into selected areas. Emulation during the ArchiCamp and presence of many experts will enable ‘Nativ to configure the first FABLAB in the frenchspeaking African area. 'nativ? In Lomé, ‘Nativ organized an « urban reporting » contest. This preliminary mass consulting was run to avoid arbitrary choices for the layout and the modelling of the Hubs. That’s how we could think about future spaces for meeting and working on ICT. Not set and closed but interactive, well-located and sensible. The purpose is to consider the burden of urban problems in the day-to-day life of Togolese people as it has been related by the contestant blogger. Further than this concern for democracy and reality in situ, the purpose was to federate and interest the blogosphere to the whole of the proposal which ‘HubCity’ of the Summer will be the result. * We use the word ‘HUB’ to group every manner of co-working spaces, including hackerspaces and fabLab. Those spaces are generally dedicated to meetings, discussions and sharing for development of projects related to Information and Communication Technologies.